Ha ha. Pretty soon this will be me. OKAY! Now it IS ME! I’m officially a food blogger who totes camera to every meal!! Follow it here….. 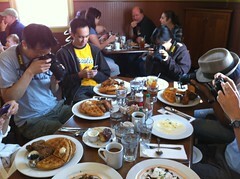 This is what Yelpers do all the time. Sometimes I am complaining at my husband because he is taking pictures and my food it getting cold. Some food is just not as good cold. I think this comes naturally to me because I am also a Yelper! Oooh, tell me your husband’s Yelp name, I’d love to follow him. Pshaw! Forget my husband, FRIEND ME! I didn’t know you were a Yelper! My husband is (I don’t know, I have to look), oh, he is just John P. I am Terre P. I sent you a friend request. He isn’t eating out as much as before because I am making his lunch. That way he doesn’t have to leave his desk. He is a salesman so sometimes being away from the desk means missed calls. Why, Hanlie? Because of the time commitment? The technology? Or something else? For me the biggest hurdle will be the time. Oh, that photo cracked me up! That’s a cool concept, using photos as a tracking tool. It would definitely help turn subconscious eating into a more mindful activity. I hesitate because of the time factor (more in the posting than in taking the photos), but considering how much time I spent calorie tracking, might not be a bad trade-off.